Svart Adam is a Swedish juggler based in Västerås, Sweden, and has been juggling since 2003. He started performing juggling and fire art in 2005 and has an education from the highly regarded circus school AFUK, Akademiet For Utæmmet Kreativitet, in Copenhagen. 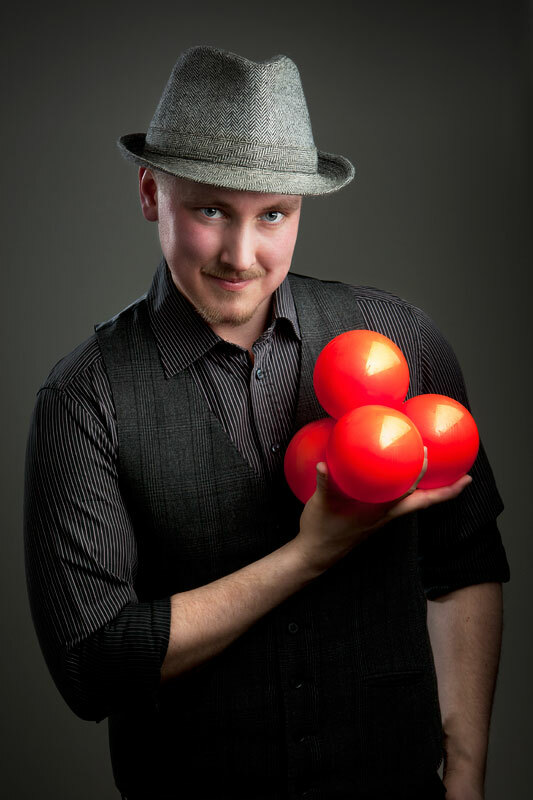 His juggling is a neo circus take on technical juggling and he manipulates up to 7 balls on stage blended together with impressive combination tricks. 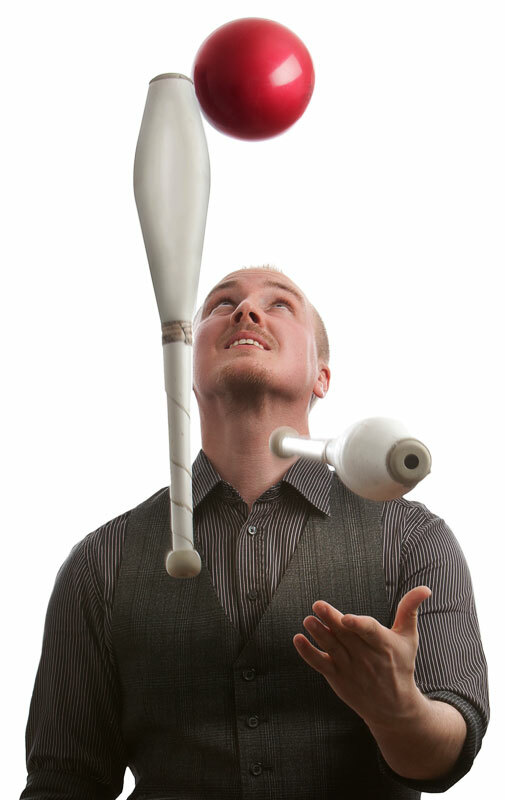 He has performed his juggling in multiple countries in both pure circus shows and events as well as different specialized juggling happenings. In 2007 he was one of the founding members of Gycklargruppen Mareld, a jesting group that travels around Sweden with medieval style jesting performances and fire shows. The group continues to be well-booked and is well-known among both other performers and organizers in the Swedish medieval scene. 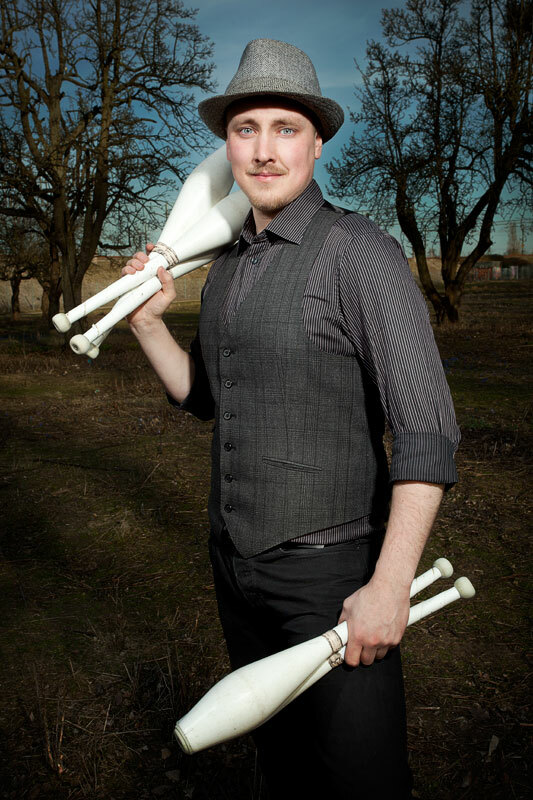 Svart Adam is also the chairman for the Swedish Jugglers Association since 2013. Svart Adam’s juggling is a combination of neo circus exploration, high technical skill and the prominent features of historic juggling before the 1950s-60s with influences from jugglers such as Enrico Rastelli, Alexandr Kiss and Anthony Gatto. The features of historic juggling that Svart Adam focuses on, are the combination tricks. That is doing multiple different skills at once, like juggling 4 clubs, balancing a club on the forehead while balancing on top of a rolling cylinder. He enjoys bringing in different equilibristic disciplines together with his juggling, like the rola-bola. In his stage acts, Svart Adam, combines the things he learned while at the circus school, together with the technique that comes from over 10 years of practising, the stage presence from 8 years of performing and the inspiration from numerous historical and modern jugglers. He juggles in his own way and tries all the time in every aspect to find new ways to deliver a show. His two stage acts are both around 5 minutes, one with music and one in silence. Both the acts includes high technical level of juggling and Svart Adam’s own research of what is possible on a stage. Mingling entertainment, the art of keeping things from not getting boring at an event. Maybe you have a bigger event where you want the participants to mingle before or after the dinner, or an opening of a new shopping mall. The mingle performance don’t require much space and is constantly moving around to lighten the mood of everyone. This act is mostly done with different kinds of juggling or with smaller fire tricks and without music. Want to learn how to juggle? Maybe you want your employees to think in a new way during work. Studies have shown that juggling is one of few activities that stimulate the brain in such ways that new pathways are formed more easily even in adulthood. Juggling is also believed to reduce the chance of Alzheimer's and other neurological problems. And don’t forget the most important aspect: It is a lot of fun. The juggling workshop comes in a variety of ways and can easily be customized after how you want it to be. Maybe just a short 1 hour workshop or a longer one that stretches for a whole day or more. Maybe all of the attendants already know how to juggle 3 balls and are looking for new challenges. The workshop can be given in Swedish, Danish or English. I had the great pleasure to employ Svart Adam Solander to perform at the gala show at the DJC (Danish Juggling Convention) 2014, where he delivered an astonishing performance characterized by new-thinking and brave creativity which made the audience hold their breath in excitement and curiosity. His contribution to our event was therefore greatly appreciated. I can warmly recommend Svart Adam if you are looking for the right person to perform a remarkable juggling show. Svart Adam Solander is a juggler of superb class! 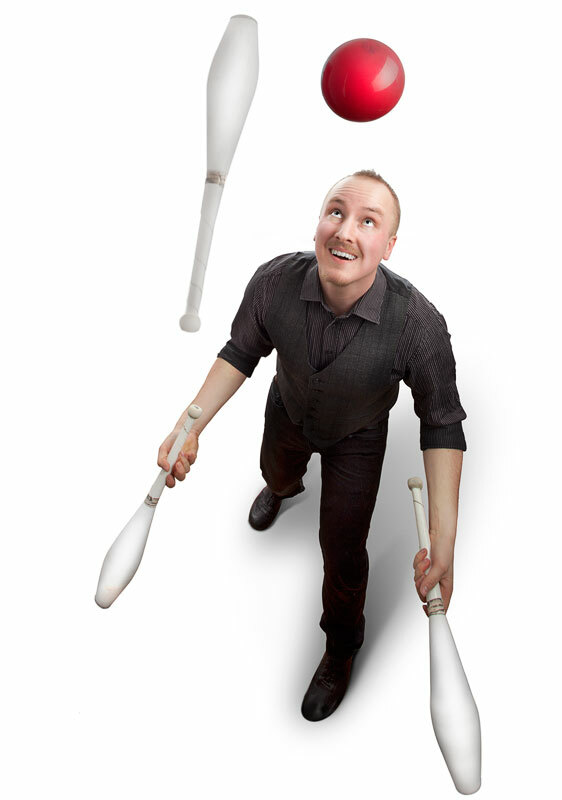 He masters many different kinds of juggling and varies his numbers in interesting and entertaining ways. E.g. his trick with five clubs on a balancing board leaves no-one untouched. I’m really pleased with his contributions in our circus shows. Svart Adam is also a skilled circus instructor and have a good connection with both his audience and his students. I would gladly hire him more times. Svart Adam is currently based in Västerås, Sweden, but available for booking all over the world. If you want to get in contact with Svart Adam for a performance, workshop or if have your own idea, don't hesitate to send an e-mail or give him a call. You can also follow him on different social networks.